First, let me mention that the Woltermann families were members of the Lutheran Church in Germany. 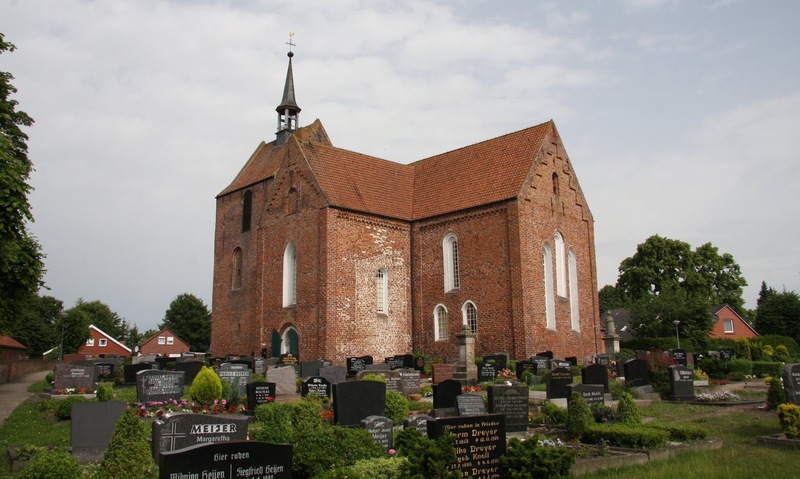 Their town of Stapelmoorheide was located in Church District V. To date I have been unable to identify which church they worshipped in. Perhaps it was the Cross Church in nearby Stapelmoor, which is one of the oldest churches in Ostfriesland. Johann (John) Gerhard was the subject of last week’s post. This week I’ll be talking about his father, Gerrit Jans Woltermann. Gerrit was born 21 November 1792 in Stapelmoorheide, Ostfriesland, Germany to Jan Geerds Woltermann and Gepke (Boelen) Woltermann. His brother Jan was born 6 October 1797, and brother Hindertje about 1804 in the same town. On 29 March 1829, Gerrit married Helena Jans Boze in Hannover. Helena was born in Brual, Emsland, Germany, which is 4 km from Stapelmoorheide but 260 km from Hannover. Why were they married in Hannover? The Cross Church in Stapelmoor would have been much closer since it was just 3.5 km away. Gerrit and Helena set up their household in Stapelmoorheide, where son Johann (John) Gerhard was born on 24 June 1829. (Maybe they married in Hannover because Helena was 6 months pregnant at the time of their marriage?) Their daughter Antje was born 16 September 1832. Antje married Johann Eugene Williams around 1852, and they had three sons: Wilhelm born in 1853, Heinrich born in 1857, and Johann born in 1862. Unfortunately, Antje died on 23 October 1865 at the age of 33. Gerrit and Helena made the decision to leave their homeland in 1869. His brother Hindertje had died in 1828, and his brother Jan in 1859, With the passing of their daughter Antje in 1865, perhaps they felt there was nothing keeping them in Germany. Especially since their son Johann had emigrated with his family in 1868. When Gerrit and Helena left Germany, their daughter's three sons accompanied them. I have no information on whether Antje’s husband Johann was still alive at that time or not. He was not listed as being on the ship with them. Gerrit was 77, Helena 70, Wilhelm 17, Heinrich 12, and Johann 6. They traveled aboard the bark "Olbers". A bark (or barque) is a sailing ship of three or more masts, having the foremasts rigged square and the aftertaste rigged fore-and-aft. The journey from Germany to the United States on one of these sailing vessels could take anywhere from five to eight weeks, depending on the winds and weather. Passengers typically had to bring their own food, bedding, and pots and pans. Due to close living quarters and poor sanitary conditions, travel for the elderly and children was particularly hazardous. The "Olbers" was named for Heinrich Wilhelm Matthias Olbers (1758-1840), who was a famous physician and astronomer from Bremerhaven. It was built by J.C. Tecklenborg in Bremehaven and delivered to its owner, a shipping company named D.H. Watjen & Co., on 23 May 1863. Its gross tonnage was 894, the length was 151.5’, the beam was 32.1’ and the draft was 20.8’. 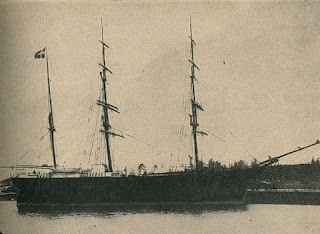 Herman Dieke was Master of the "Olbers", which sailed from the Port of Bremen to Baltimore, Maryland. There were 392 passengers on this particular passage. In notes that were transcribed by the Immigrant Ships Transcribers Guild, it is noted that the Woltermann family was from Stapelmoor, Ostriesland, and that the three children were the grandchildren of Gerrit. It also states that Helena was the second wife of Gerrit, and that her maiden name was Boose/Boze. So far I have seen no records to indicate that Gerrit was married prior to his 1829 marriage to Helena. Most importantly, it is also recorded that Gerrit died on the journey and was buried at sea. The "Olbers" arrived in Baltimore on 20 July 1869. Helena somehow got herself and the three children from Baltimore to Forreston, Ogle, Illinois where her son Johann (John) and his wife Anna and their children had been living since leaving Germany the previous year. In the Forreston 1870 census, Helena was in the household of John and his family, and so was her grandson Johann. I have found her other grandson Wilhelm living with another family in Forreston as a hired hand, but I don’t know where Heinrich was residing. He would have only been 13 at that time. In the 1880 census Heinrich was living with brother Wilhelm and his family in Forreston, and Johann was a farm hand living with an unrelated Forreston family. By 1880 Johann (John) and Anna had moved to Carroll County, Iowa and Helena went with them. She died after 1880, probably in Wheatland Township, Carroll, Iowa. It is unclear where she was buried. I do not see a burial listing for her at Saint Bernard Cemetery in Breda, which is where her son and some of his family were laid to rest.